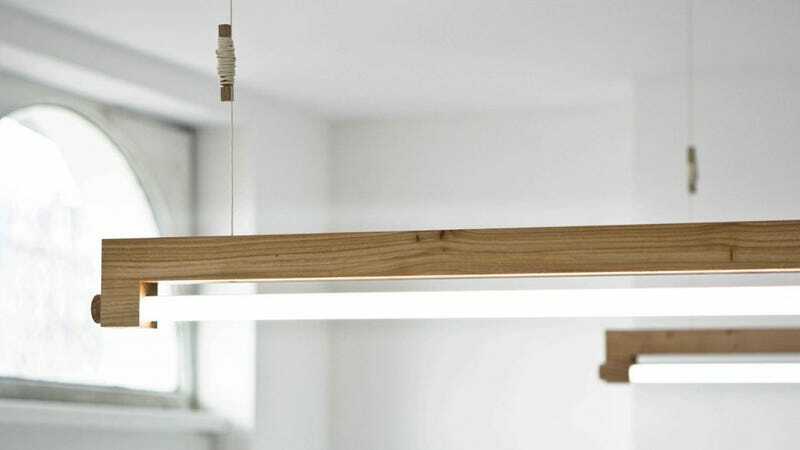 Ninebyfour is a limited edition of 79 light fixtures, each made from a single piece of Stadshout, or "city wood": timber felled around Amsterdam's public spaces and destined for the chipper, but saved here to be transformed into something new. The Waarmakers design duo crafted every one by hand, then outfitted them with a sleek Phillips LED tube that's shaped like the neon of yore—but won't heat up or burn out. And dang, that kicky red cord is great. A cork stamped with the geographical coordinates of the tree's original location holds the long bulb in place; so if you're feeling sentimental and would like to find out a bit more about your piece's origin story, all it takes is entering the numbers into Google and seeing where the grown up sapling spent its formative years.